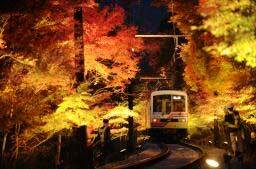 Illumination of "Momiji Tunnel," or a railway track with autumnal foliage arching over it, began on November 7. Located along the Eizan Electric Railway Kurama Line running through the northern part of Kyoto City, passengers enjoyed the scenery through the windows. The event will continue until November 29. Approximately 100 lights are set up along both sides of the roughly 250-meter-long track section between Ichihara and Ninose Stations in Sakyo Ward, Kyoto. Approximately 280 trees, including Japanese maples and others, have been lit up, and for approximately two minutes, the train runs slowly through the maple tunnel with the its interior lights off. 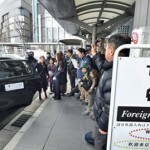 Taking commemorative pictures through the windows as well as standing up to gaze intently at the passing scenery, passengers fully enjoyed the autumn leaves. 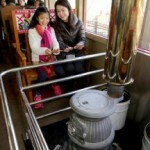 According to Eizan Electric Railway, the best time to enjoy the color is expected to be around the middle of November. 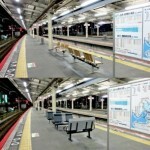 It will be illuminated from sunset to around 9:00 p.m.